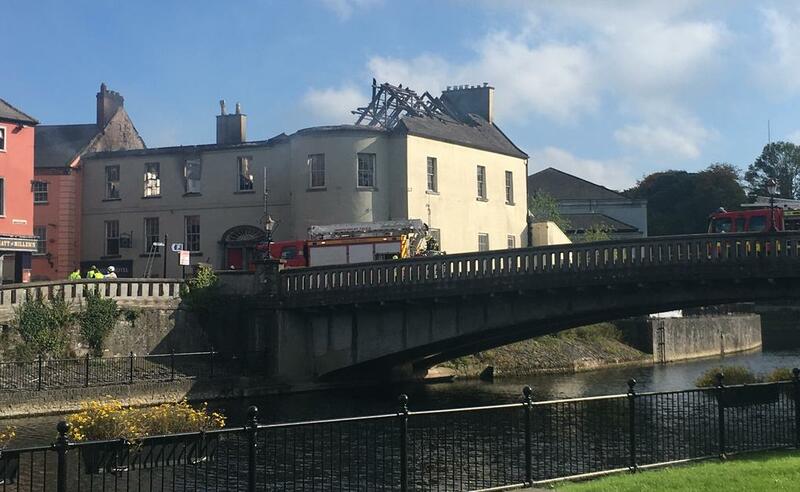 John Street in Kilkenny is closed off to traffic again this morning in the aftermath of yesterdays devastating fire at iconic Bridge House. Two people were arrested in connection with the blaze yesterday. The owners say they’re waiting now to assess the damage. The historic building was purchased last year by the Neville Group which also owns the River Court Hotel just behind it. Yesterday morning’s blaze is understood to have taken all of the upstairs of the house with it, as well as the building’s roof. “They had just recently been submitted for pre-approval. We had great plans for it, and please God we still will once we get back in and are able to assess the damage that has been done. Meanwhile, architect Orla Kelly says she was devastated to hear about the fire in that building because she had been in it taking photos about 20 years ago. She says it’s scandalous that something hadn’t been done with it. And, the Heritage Council’s Architecture Officer, Colm Murray says it’s not only a devastating loss for the city’s landscape but for the history of the city. He says the situation could have been a lot different had it not been vacant for a couple of decades.